”Slice up your storm-felled trees! 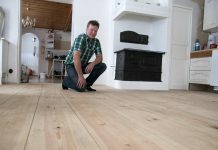 It is done quickly and you preserve all the good qualities of the timber.” This advice comes from Logosol’s founder, Bengt-Olov Byström, who continues thinking small-scale after the hard winds of this winter. 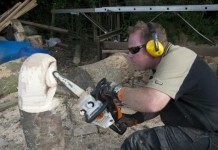 The method of slicing up logs into thick, rough-edged boards has many advantages. “This is how people have done with the most valuable timber in all times. 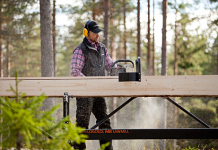 Sawn timber can be left lying a generation without being damaged,” says Bengt-Olov Byström. The most efficient way to do this is to cut the logs into rough-edged boards, 2-3 inches thick, which you then stack for drying with spacers between them. 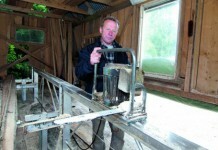 This method dramatically increases the capacity of your sawmill. “This way you can saw between 10-20 cubic metres a day depending on what saw unit you use,” says Bengt-Olov. In addition, logs that are sliced up without being edged do not warp as much as planks and boards during drying. Rough-edged boards are used as raw material by furniture factories and joiner’s shops. The advantage is that cracking is reduced to a minimum. Afterwards, you saw the dimensions you need. Logosol cannot solve all the problems when it comes to storm-felled trees, but it can certainly be part of the solution. “The most important contribution is of the psychological kind. You can do something instead of hopelessly waiting for the forest machines to arrive,” says Bengt-Olov Byström. Like many others who have contacted Logosol in this matter, he thinks that people talk too little about other possibilities than underselling the trees as pulpwood or sawtimber. 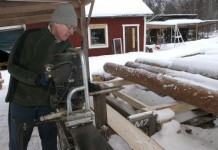 For those who have their own sawmill and need timber, it is more profitable to take care of at least some of the trees. Bengt-Olov points out that storm-felled woods are dangerous work sites. A lot of the trees must be taken care of by machines. Unfortunately, there have alreaydy been too many accidents, and some of them have been fatal. 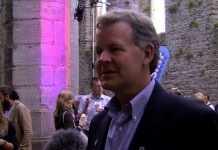 “Only get to grips with trees that are lying freely and are not uprooted,” he recommends. 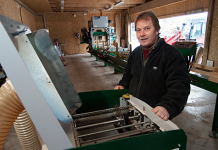 The harmless trees are sufficient to give you many workdays at the Logosol Sawmill.